So you need a root canal. DON'T PANIC! You have a right to understand the procedure you are about to undertake and what to expect from it. Root Canal Therapy allows you to maintain teeth that not too many years ago would have been extracted. The technique we utilize is by far the finest, most modern and successful technique known today. Fortunately, we can offer you this treatment instead of the alternative, which is the loss of your tooth. For any one of many possible reasons, the nerve inside your tooth is no longer healthy. This loss of vitality can be a result of decay, tooth fractures, root fracture, temperature stress, or unidentifiable causes. Deterioration of this nerve can cause an infection in and around your tooth and manifest itself in pain, swelling, temperature and/or pressure sensitivity, or throbbing. It is also possible to have none of these symptoms and have the infection discovered on examination of an xray. 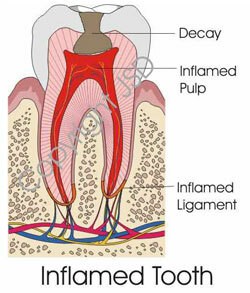 Regardless of the reason, the infection is present and must be treated to save the tooth. Endodontic Therapy has a very high degree of success, up to 90%. We will discuss with you the chances of success before any endodontic procedure to help you make an informed decision. A local anesthetic will be given. A sheet of latex called the "rubber dam" (we have non-latex too) will be placed around the tooth to isolate it, keeping it clean and dry during treatment. The treatment consists of three to four basic steps, but the number of visits will depend on your particular case. Some treatments take two visits but many are just a single visit. Fortunately, most teeth respond to our efforts by conservative treatment. A few teeth may require more involved treatment; for example, surgical endodontic therapy if the tooth can be saved. If it is determined that the tooth has a fractured root, then saving the tooth may not be possible. Successful endodontic therapy is just the beginning point to saving your tooth. Upon completion of your therapy, rebuilding or core stabilization of your tooth may be necessary by your general dentist. Following this, a final restoration (ranging from a filling to a protective crown) may be required. The specific treatment for your tooth will be discussed by your doctor. 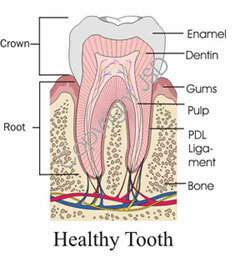 Once completed, your tooth will once again be a fully functional part of your mouth and smile. We will be pleased to discuss any and all aspects of your treatment with you at this time. If you have any questions regarding this or any other type of treatment, please feel free to ask.